Firefighters are not just community helpers, they are indeed, everyday heroes. Celebrate a career of rescue with the wall stickers in this Fire Brigade peel and stick appliques pack. Easy to apply and easy to reposition, these RoomMates Fire Brigade repositionable wall decals feature fire trucks, dalmatian, ambulance, and fire fighting equipment, along with many coordinating accent pieces. 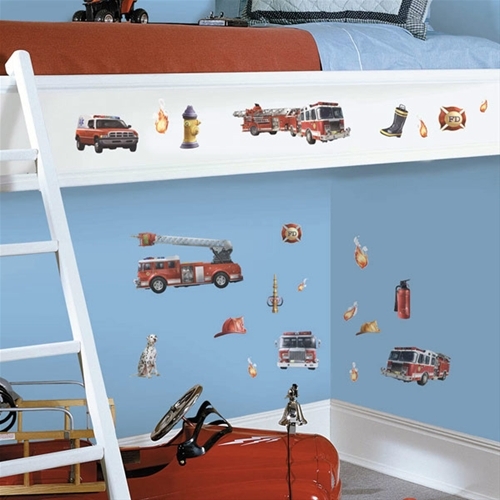 Our RoomMates Fire Brigade wall decals (also known as wall stickers or wall appliques) are repositionable, removable, re-usable, and washable... a parent's dream combination for kids' wall decorations. Whether you are transforming bedroom, playroom, or even classroom walls, our peel and stick Fire Brigade wall stickers offer decorating ease with no damage or residue to the surface when removed. Approx. 1.375" x 2.25" to 16" x 9"
This customizable Fire Truck fabric wall art is a wonderful addition to any cityscape, community heroes, or other outdoor theme. This fun School Bus fabric wall art is a wonderful addition to any child's room decor.